Charleston, South Carolina is a food town. Good old southern cooking is available, but so is fresh farm to table cuisine. Located at 18 Pinckney Street in the historic district is a charming old house off the beaten path with culinary magic happening inside. A creation of Executive Chef John Zucker, the name inspired me to expand my French. When I searched the name of the restaurant for meaning, I learned that cru is French for growth. The theme proved consistent when I opened the menu to discover a thank-you to 11 local suppliers of fresh, locally grown or prepared products used in the restaurant. One of these purveyors was Mepkin Abbey, a Trappist Monastery where the monks grow oyster mushrooms for this Holy City restaurant. It is no wonder the food tastes divine! My choice was the first item on the menu, the Chinese Chicken Salad. I was enticed when I saw this entrée delivered to the next table. I asked our friendly, southern neighbor what she had ordered, and decided I did not need to look any further. Seeing is believing. The salad was light and refreshing on a hot summer day. 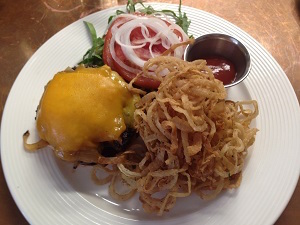 The Angus Burger au Poivre invoked moans and groans from its patron, satisfying a more hearty appetite. Southern flair is gently infused into the menu with options like the BBQ Beef Brisket Sandwich, Fried Oyster Hoagie, and Shrimp BLT. The beer list included seven local choices, perfect for the traveling beer lover who wants to sample local ale along the trail. The wine list was extensive for a lunch menu, with choices of 10 reds and 10 whites from around the world, all sold by the glass or bottle. The restaurant is small, with tables in what appears to be the original living room and dining room of the house. There is also porch seating, which was full on a hot, humid summer day. I read the crowded porch as a testament to the quality of the food. If patrons are willing to sit outside on a blistering day to eat, the food must be good. 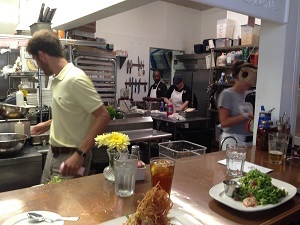 We sat at the Chef’s table, four bar stools with a view peering into the kitchen. It was a treat to watch the chefs efficiently prepare the plates. The staff was kind and friendly, answering my many questions about their preparation, but moving quickly to accommodate the volume of guests waiting to eat. There was also a community table, able to accommodate a large party of up to eight, but also used to seat smaller parties and singles as needed. I find the community table a great place to eat when traveling, as it is a good way to share travel tips with fellow tourists or to pick the brains of locals about their city. Reservations are encouraged by calling (843) 534-2434, as the wait for salivating patrons without them was over an hour. Even with reservations you may have to wait a few minutes, but the host was glad to take drink orders before our table was ready, helping everyone to cool down and relax in preparation for this rejuvenating dining experience in the middle of a busy sightseeing day.